Just over three years ago, formfunctionform owner Shawn Reed was browsing the Internet, looking for products that fit his own unique style. After browsing through countless websites and online stores, he decided to embark on creating his own company, formfunctionform, that specializes in a variety of leather-based goods including wallets, wristbands, bracelets and more. Honestly, at this point, I wish all of our customers would use Amazon Pay because it's easier for us and easier for them. Both of us are protected. In only a few years, formfunctionform now has two — sometimes three or four people — preparing the products, and shipping them out from the company’s Florida headquarters. Shawn noted that about 60% of their sales are direct on the website, so having a streamlined purchase process is critical for them. When Shawn first began envisioning how the formfunctionform site would come together, he wanted to ensure that the site was minimal, simple and easy-to-use. The team worked with a designer to strip down an existing WooCommerce theme, customizing it to fit their needs. After launching on their new, clean website design, they looked to select a payment option that was right for them. The company started out with two different payment options, but quickly experienced issues with fraud. One bad experience turned into a huge hassle, as the formfunctionform team consistently had to ensure they weren’t fulfilling fraudulent orders. 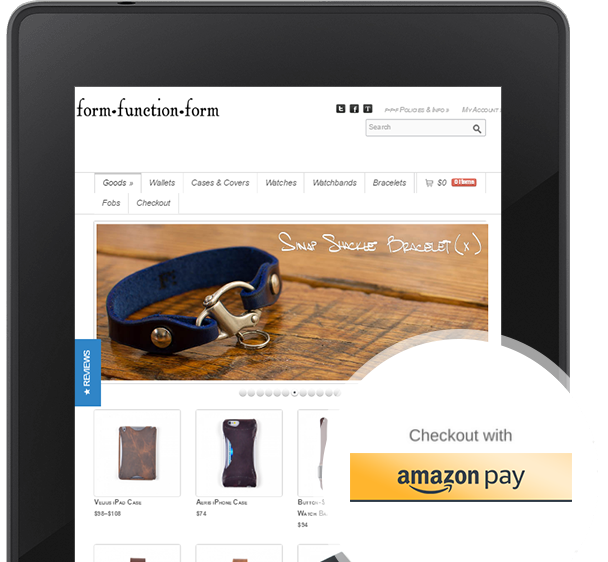 When Amazon Pay was first offered on WooCommerce, Shawn jumped all over it. If a purchase came in through Amazon Pay, he was not worried about fraud and fulfilling invalid transactions. Shawn also notes the customer convenience of having payment and credit card information already stored with Amazon. "Customers like the ease and familiarity with Amazon. Amazon is something they already know; something they are comfortable with. They already know their login and password — they simply type their credentials in, and place their order; no card numbers to punch in, extra security codes, addresses; everything is already there in their Amazon account and brought right over." Once Amazon Pay was up and running on Shawn’s website, the company took off: "Amazon Pay accounts for over half of our sales on a regular basis,” said Shawn. He also notes the convenience of processing returns and refunds within the WordPress admin interface. "Another really nice thing is that we can process returns and refunds directly within our WooCommerce WordPress Admin tab, so if a return comes back, I can just sign right on, find the order really easily, and send the refund to the customer right from within WordPress Admin." Between the customer convenience and fraud protection, Shawn views it as a big win for his company. "All of our customers have been increasingly voting with their wallets, so it's pretty clear that they prefer to Amazon Pay, and we've been really happy with it." * For more information on how Amazon Pay can help protect you from fraudulent transactions, please see the Payment Protection Policy in the Amazon Pay, Inc. Customer Agreement located at https://pay.amazon.com/us.